As perfect as a summer day, this flower arrangement has a sweet look and style that is set to delight your recipient with each bold bloom. Bright red gerbera daisies, carnations, mini carnations, and roses catch the eye against a back drop of clean white daisies, gilly flower, and limonium, accented with lush greens. 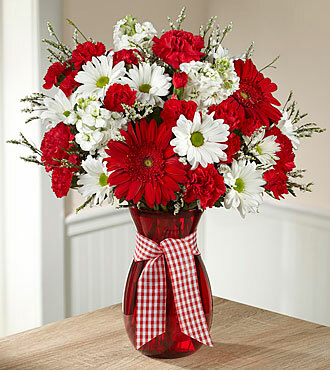 Presented in a red glass vase tied with a red and white gingham ribbon for that extra special touch, this beautiful flower bouquet is ready to celebrate a birthday, anniversary, or as a way to send your congratulations wishes. STANDARD bouquet includes 14 stems. DELUXE bouquet includes 18 stems. PREMIUM bouquet includes 22 stems.